FILE - In this April 9, 2018, photo, Deputy Secretary of Defense Patrick Shanahan, right, listen as President Donald Trump speaks during a cabinet meeting at the White House, in Washington. President Donald Trump said Sunday that Deputy Defense Secretary Patrick Shanahan will become the acting Pentagon chief on January 1, replacing Defense Secretary Jim Mattis, who announced his resignation last week. "I am pleased to announce that our very talented Deputy Secretary of Defense, Patrick Shanahan, will assume the title of Acting Secretary of Defense starting January 1, 2019," Trump tweeted, moving to push current Defense Secretary Mattis out of his post two months early. Shanahan, a former Boeing executive, was named Deputy Secretary of Defense in 2017. Mattis' resignation letter, submitted to Trump in person on Friday, had said he would leave the post on February 28. FILE - Then-Defense Secretary Jim Mattis waits for Chinese Minister of Defense General Wei Fenghe to begin an arrival ceremony at the Pentagon, Nov. 9, 2018. 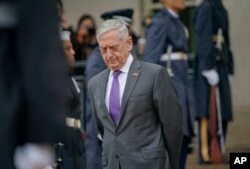 The defense secretary’s decision came one day after Trump announced he would withdraw some 2,000 U.S. troops from Syria, a move the Pentagon opposed. Mattis did not mention the dispute over Syria in his letter, but he did note his "core belief" that U.S. strength is "inextricably linked" with the nation's alliances with other countries. President Trump first announced Mattis's departure on Twitter, saying the former four-star Marine general will retire "with distinction." While not mentioning Trump by name, the letter from Mattis outlined sharp differences between his views and those of the president, notably on the importance of allies and the use of U.S. power.